TEBAK SKOR! Menangkan Jersey Authentic LaLiga dan Hadiah Menarik Lainnya! Dapatkan kesempatan memenangkan Jersey klub LaLiga! 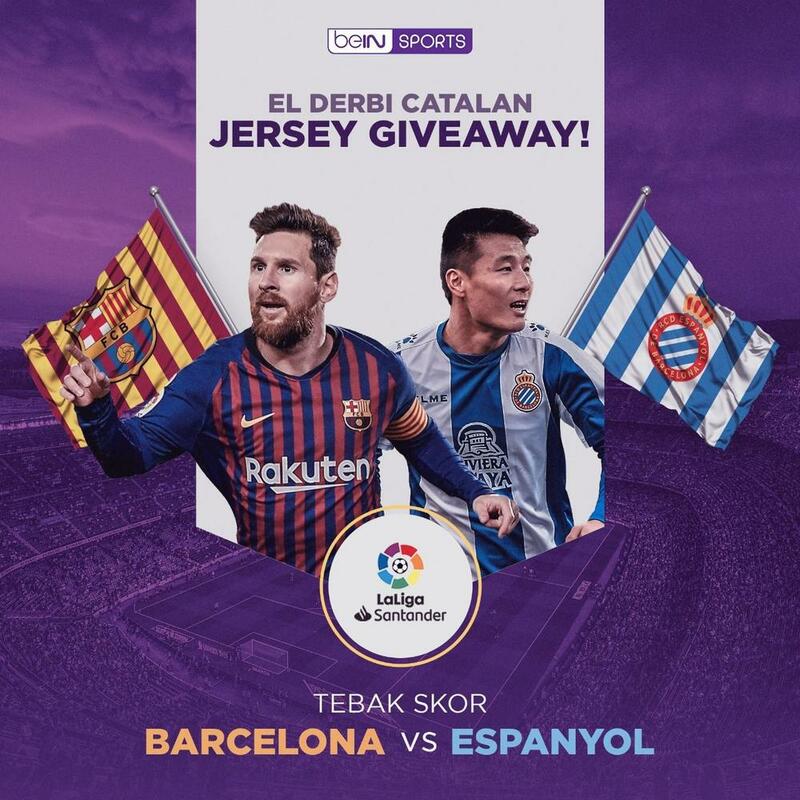 Tebak skor dengan tepat maka sebuah jersey authentic dan beragam hadiah menarik lain dari LaLiga bisa menjadi milikmu! Dapatkan kesempatan memenangkan Jersey klub LaLiga! Tebak skor dengan tepat dan sebuah jersey authentic menjadi milikmu! Petunjuk mengikuti quiz tebak skor! Step 1: Tebak skor pertandingan antara Barcelona vs Espanyol! Step 2: Berikan prediksi skor kamu di kolom komen pada halaman Facebook kami. Step 3: Pemenang akan diumumkan di www.facebook.com/beinsportsindonesia pada 2 April 2019! Entry is free and open to Indonesia residents aged 18 and over at the time of Entry who have fulfilled the eligibility requirements as set out in these T&Cs (“Eligible Entrant(s)”). Employees (or Family Members of employees) of, any of, beIN SPORTS Asia Pte Ltd, any companies associated with the Contest and promotion of the Contest and all affiliates of such aforementioned companies are not eligible. “Family Members” means spouse, ex-spouse, de-facto spouse, child or step child (whether natural or by adoption), parent, step parent, grandparent, step grandparent, uncle, aunt, niece, nephew, brother, sister, step brother, step sister or 1st cousin. Only Eligible Entrants may be awarded and/or accept a Prize. The Contest begins on 28th March 2019 at 5 PM and ends on 30th March 2019 at 10pm (the “Contest Period”). Entries must be received by beIN SPORTS within the Contest Period..
To enter, Eligible Entrants must visit http://bit.ly/tebakskorlaligacatalanderbi during the Contest Period, follow beIN SPORTS Indonesia Facebook account and provide his/her entry by commenting on the “CONTEST POST” with their entry answer (“Entry” or “Entries”). each Eligible Entrant may submit multiple Entries but he/she cannot win, from any contest conducted by beIN SPORTS, more than once in the last six (6) months commencing from the date of his/her Entries (“Past Winners”). All Past Winners may have all their Entries invalidated. This is a skills based competition and chance plays no part in determining the winner. Entries will be judged based on their accuracy and speed. On 2th April 2019 at 12:00PM, beIN SPORTS will select two (2) winning valid Entries which best meet the judging criteria referred to in clause 7 as the winner. beIN SPORTS will notify winner via https://www.beinsports.com/id and an announcement post on our official Facebook page at https://www.facebook.com/beinsportsindonesia and publish his/her name (“Prize Winner”). If any of the Prize Winner(s) do not respond and claim the Prize within twenty-four (24) hours after the date of notification, beIN SPORTS may then select a substitute winner and attempt to contact such substitute winner through Facebook announcement post in accordance with this clause 10 until two (2) Prize Winners have claimed the Prizes (“Substitute Winners”). beIN SPORTS may refuse or disqualify any Entries (including winning Entries) if the Eligible Entrant concerned or anyone authorized by the Eligible Entrant to deal with their Entry, acts in a way towards either beIN SPORTS, its affiliates, partners, or their agents or staff which beIN SPORTS reasonably considers to be inappropriate, unlawful or offensive. If a Prize Winner is disqualified, beIN SPORTS reserves the right to award the Prize to a Substitute Winner in accordance to Clause 9 above. Nothing in these T&Cs limit, exclude or modify or purports to limit, exclude or modify the statutory consumer guarantees as provided under Law No. 8 of 1999 on Consumer Protection (as amended from time to time) or any similar consumer protection laws in Indonesia (“Non-Excludable Guarantees”).